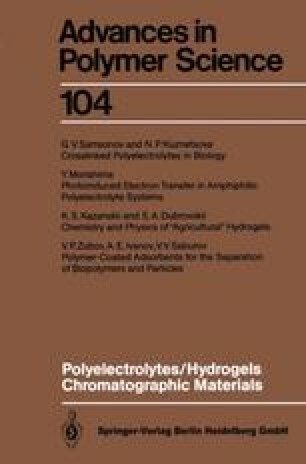 This review deals with the structure and properties of highly permeable crosslinked polyelectrolytes synthesized mainly by using acrylic acids and various polyvinyl crosslinking agents. Special attention was directed to macro- and heteroreticular polyelectrolytes with high inhomogeneity. The mobility of parts of polymer chains located between chemical and physical junctions was demonstrated. The biological aspect of these systems was analyzed on the basis of thermodynamic selectivity and kinetic relationships in the interaction between crosslinked polyelectrolytes and biologically active molecules and ions. Special emphasis was put on the properties and application of the microdisperse forms of crosslinked polyelectrolytes. The possibilities of using highly permeable crosslinked polyelectrolytes for immobilization of proteins (and enzymes) and new approaches to the use of crosslinked polyelectrolytes biosorbents in preparative chromatography were also considered.